The last installment of the Kolter Kinder email series went out on Friday, August 17. You can find it archived on the Kolter Kinder: Guide for Parents page. This final email summarized what happens in a typical kindergartener’s day and offered info on snacks and lunches. Welcome to Kolter, our newest Cougars! 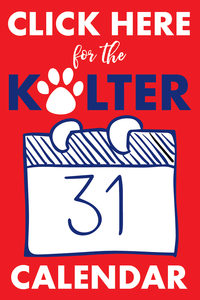 The Kolter Kinder: Guide for Parents page has been updated with the latest email in the series — all about Kolter events. Get in the know by visiting the email archive or downloading the Kolter Events 101 handout. The latest email in the Kolter Kinder: Guide for Parents series went out August 3 to parents of incoming kindergarten students. Read Part 2 – Transportation, Parking, Pick-Ups & Drop-Offs for details on how to get your Cougars to and from Kolter North. If you missed the first communication, check out the Kolter Kinder: Guide for Parents page for an archive of all emails.